Privacy, serenity and beauty! You'll have all of this in this gorgeous 5 acre property located in the coveted Deerfield Subdivision in charming Franktown! 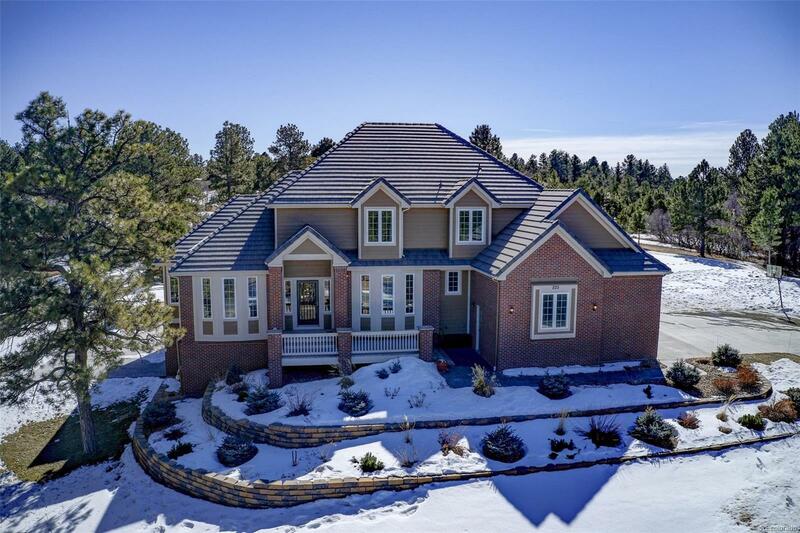 Be enchanted by this beautiful custom built 2 story surrounded by towering Ponderosa Pines. Relish in your own private oasis with the peace and quiet of this lovely property adorned with gorgeous professional landscaping, a huge stamped concrete patio and a massive sun soaked private deck. This elegant home boasts a main floor master suite with attached study/office/TV hang out...or maybe nursery? 3 huge bedrooms (including a 2nd master suite) upstairs, vaulted ceilings, 2 elegant gas fire places, chefs kitchen with large granite island and double ovens, cozy family room and nook over looking the south facing irrigated back yard. The dogs will love roaming your land with 2 acres fenced with electric dog fencing! Awesome 3 car oversized garage adorned by an impressive concrete driveway!! Newer furnaces, A/C's & exterior paint too! Association Name Primary: Deerfield Homeowners And Property Owners Inc.